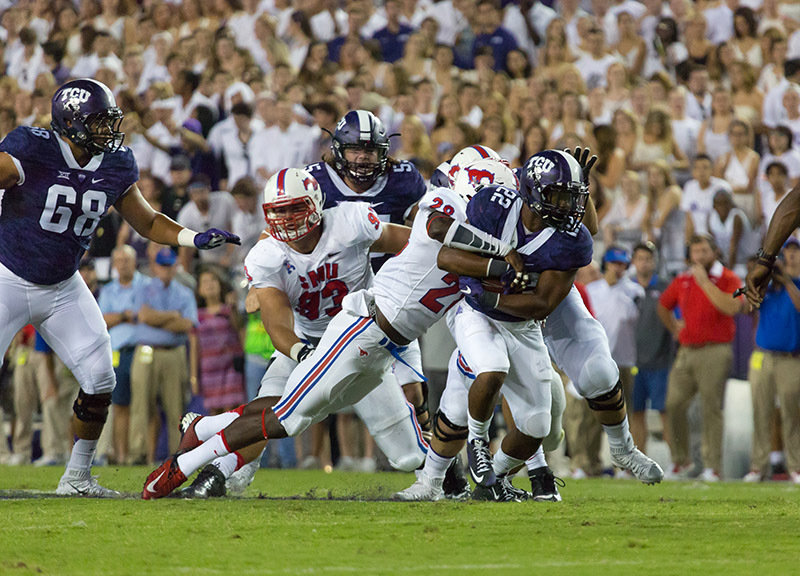 TCU and SMU's Battle For The Iron Skillet Finally Felt Like A Battle On Saturday Night. 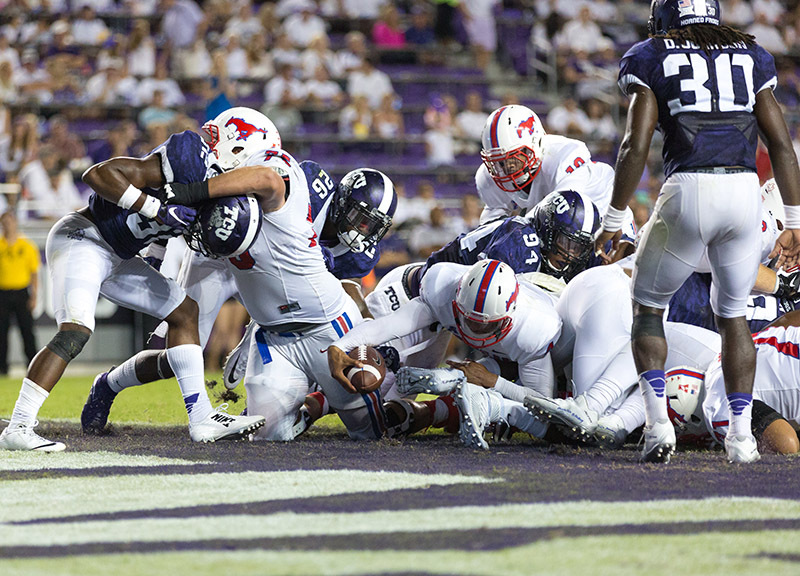 For the first time in several years, the Battle for the Iron Skillet rivalry game between SMU and TCU Saturday evening actually felt like a battle. Despite the misleading final score of 56-37, TCU’s victory was hard-fought over the new head coach Chad Morris' resurgent Mustangs. The win took over 700 yards of total offense and a pair of late-fourth quarter touchdowns before it was ever really won, and, with an ailing defense, the Horned Frogs more than ever yet this season had to rely on its Heisman hopeful quarterback Trevone Boykin to gut this one out. The senior quarterback threw for 454 yards, rushed for another 50 and accounted for a total of six touchdowns on the night. His efforts had his team sitting pretty with a 42-17 lead early into the third quarter, but SMU’s own dual-threat quarterback, Matt Davis, then carried the Mustangs back into the game. Davis put together a quick seven-play, 75-yard drive capped off with a rushing touchdown by the quarterback. On the next drive, SMU defensive back Horace Richardson picked off Boykin, giving the ball back to Davis, who then scored another rushing touchdown on the drive. 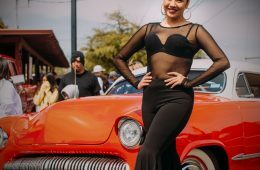 By the middle of the fourth quarter, the Mustangs had racked up 20 unanswered points, cut the lead to 37-42 and had serious momentum on their side. 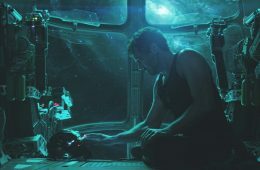 Only then did the Horned Frogs' pedigree come to light as the team went back to its top passing option of Boykin-to-Doctson, with the two connecting on a 42-yard touchdown to all but seal the victory. Boykin, after the game, seemed unfazed by the shootout. Seems Boykin and company are going to have to continue to score a lot of points if the defense keeps getting depleted by injures. The Horned Frogs lost yet another defensive starter during this game, as lockdown corner Ranthony Texada suffered a knee injury that will force him to miss the rest of the season. 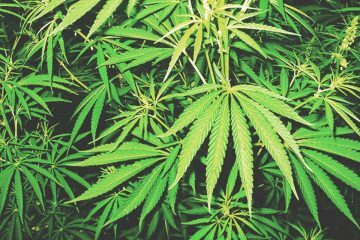 With Texada out, Davis had ample opportunity to go deep to his favorite target in 6'4, 215-pound wide receiver Cortland Sutton, who caught four passes for 115 yards and a touchdown. TCU head coach Gary Patterson quickly learned that teams are going to test his team vertically now that his defense has lost both Texada and safety Kenny Iloka. In the end, though, the No. 3 ranked Horned Frogs continued along on their intended path toward a College Football Playoff berth, upping its record to 3-0. In its own continued turnaround attempt under Morris, the Mustangs have started off the season 1-2. Three games into the season, it seems as if each of these two teams are still trying to figure out how good they are. 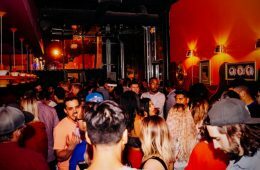 Outside of SFA, which TCU routed 70-7 last week, the Horned Frogs struggled with the Minnesota Golden Gophers in Week 1 (squeaking out a 23-17 victory) and then struggled to put away SMU Saturday night. 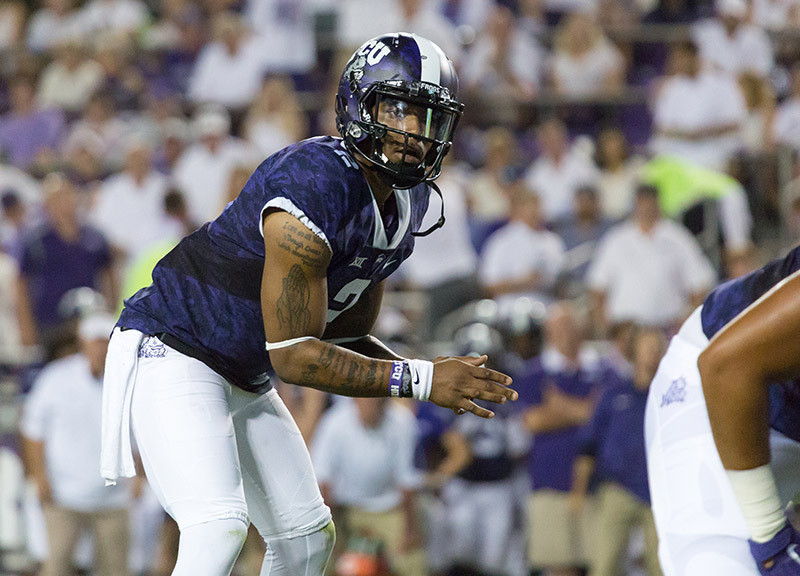 Even if the team has a Heisman-esque quarterback in Boykin, its defensive woes are cause for concern going into conference play. 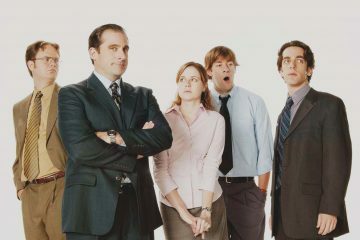 The Mustangs, on the other hand, have a lot to feel good about. 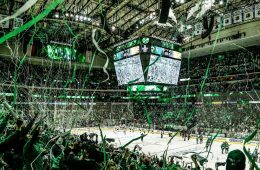 SMU has now already faced two top-five-ranked teams in the nation and, at times, had each of those opponents on their heels. 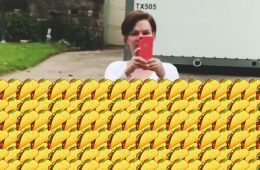 The team's first and only win of the season thus far was a redeeming and rather dominant 31-13 victory over North Texas. Thus far, quarterback Matt Davis has flourished under Morris' direction, and the defense is quickly becoming noteworthy in its own right. The Horned Frogs head to Lubbock next weekend to face the Texas Tech Red Raiders and The Mustangs head home to face the James Madison Dukes for homecoming. 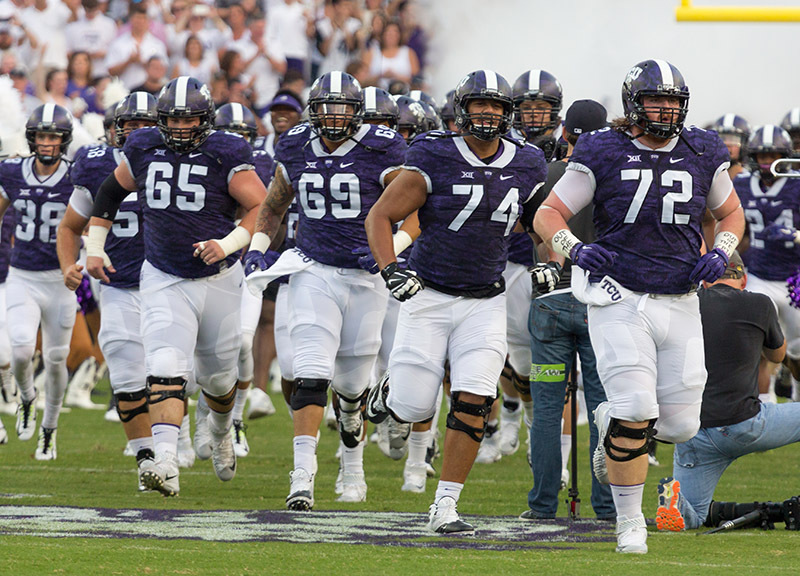 TCU offensive linemen lead the Horned Frogs onto the field at Amon G. Carter Stadium to face the SMU Mustangs. SMU quarterback Matt Davis (4) is flushed out of the pocket by the TCU defense in the first half. 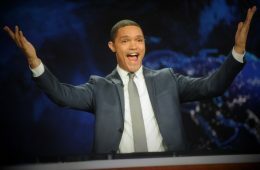 Davis scored multiple rushing touchdowns for his second straight game. TCU wide receiver KaVontae Turpin (25) breaks away from the SMU defense to score a touchdown in the first half against the Mustangs. Turpin led the Horned Frogs in all-purpose yards with 190. 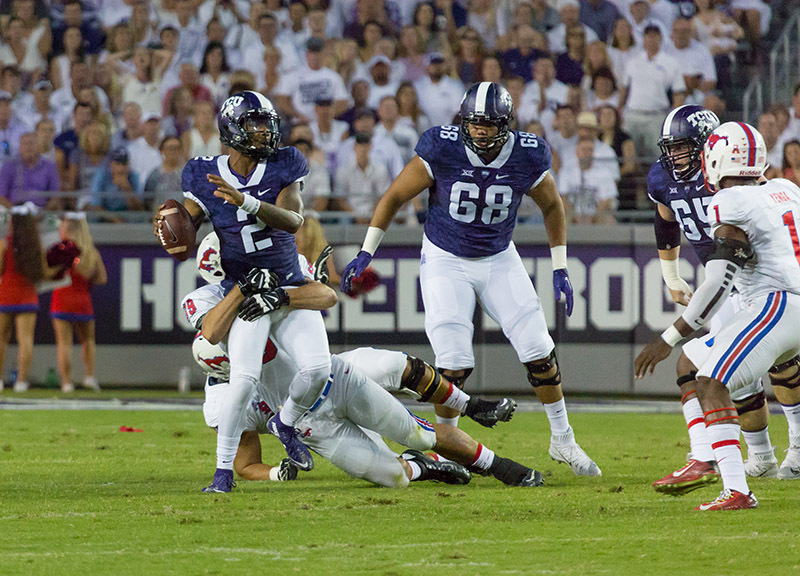 TCU quarterback Trevone Boykin (2) is sacked by SMU defensive lineman Justin Lawler (99). Lawyer had six tackles in the game and one and a half sacks. TCU running back Aaron Greene (22) carries SMU linebacker Shakiel Randolph down the field. Greene ran for 165 yards on 21 carries and scored two touchdowns against the Mustangs. TCU wide receiver Josh Doctson (9) catches a pass along the sideline in the first half. 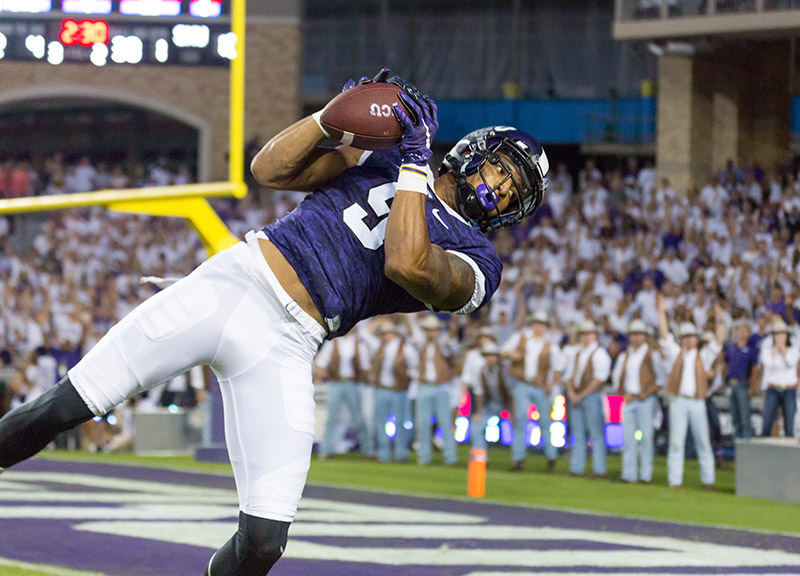 With his two touchdowns in the game, Doctson moved to second all-time in touchdown receptions in TCU history. 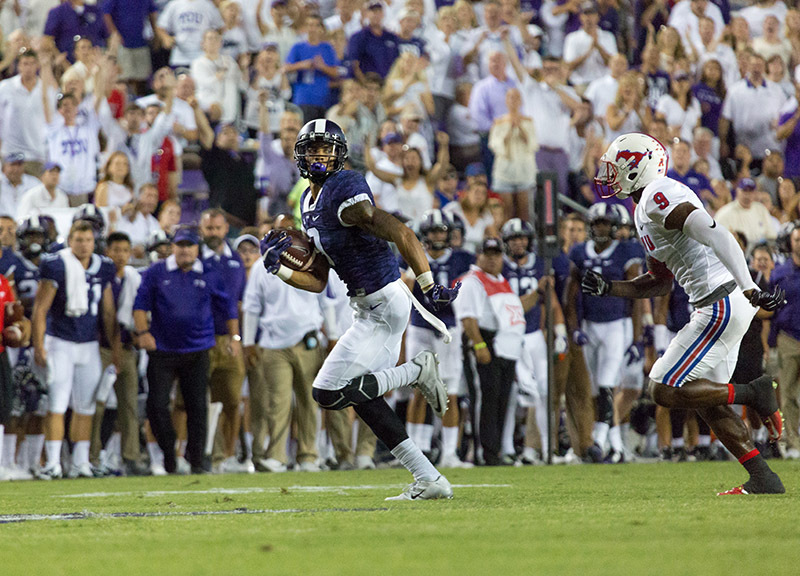 TCU wide receiver Josh Doctson (9) breaks away from the SMU defense. Dotson led the team with 171 yards receiving and two touchdowns. TCU quarterback Trevone Boykin (2) scans the secondary pre snap. 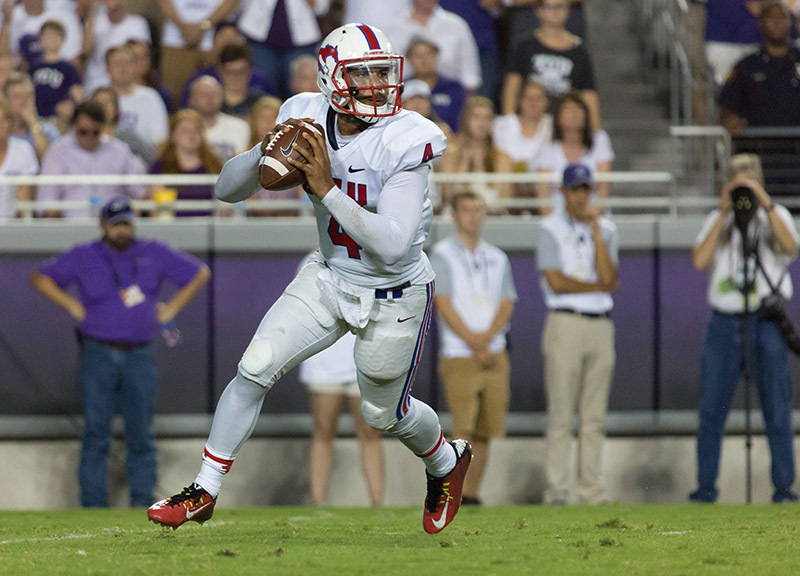 SMU quarterback Matt Davis (4) rolls out of the pocket. 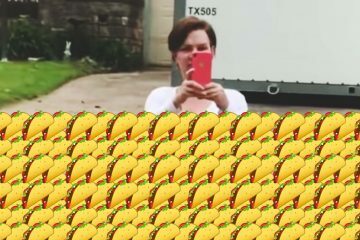 Davis threw for 330 yards against the Horned Frogs. 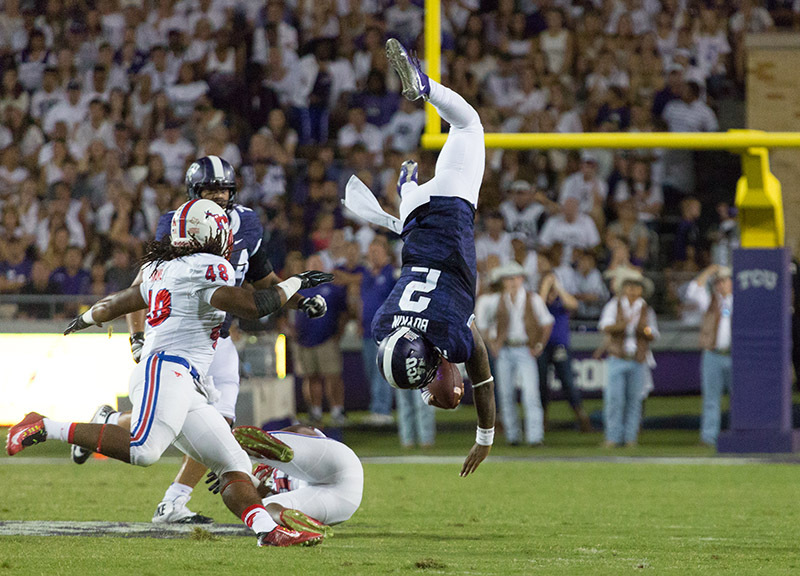 TCU quarterback Trevone Boykin (2) is upended by SMU linebacker Kyran Mitchell (11). 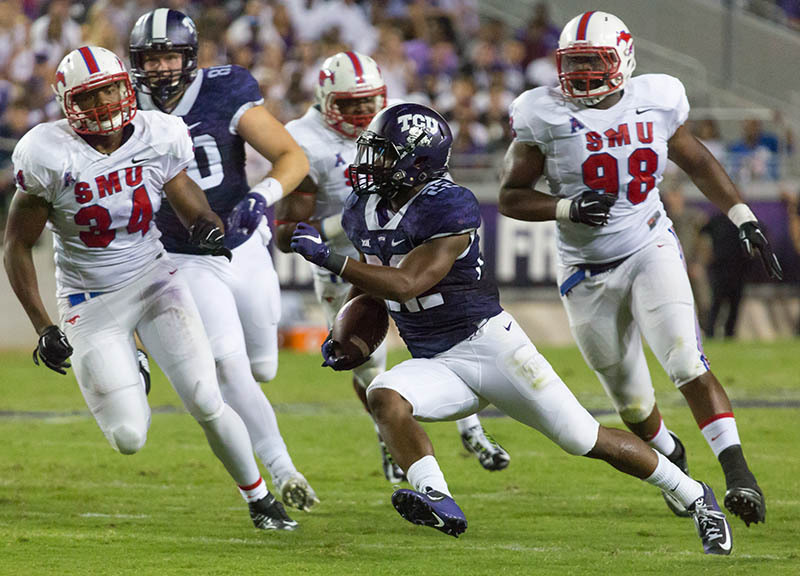 TCU running back Aaron Greene (22) dashes through the SMU defense. 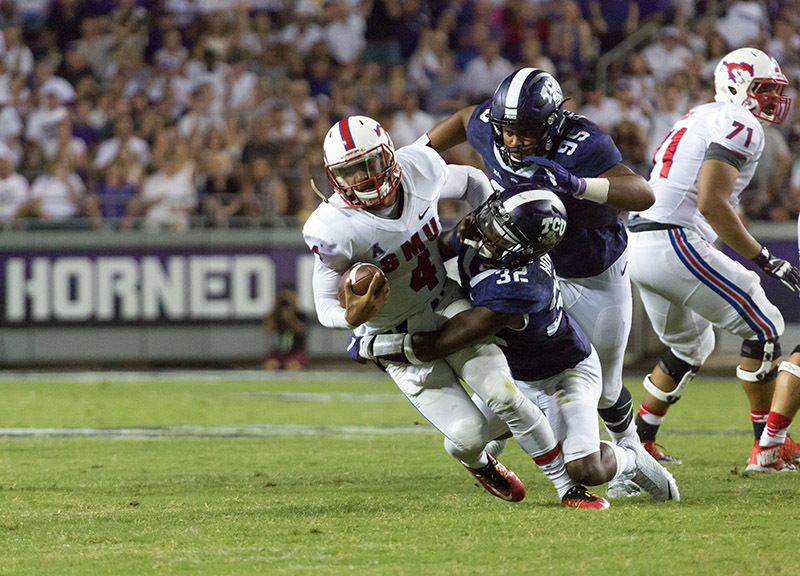 SMU quarterback Matt Davis (4) is sacked by TCU linebacker Travin Howard (32). Davis was sacked three times by the Mustangs. 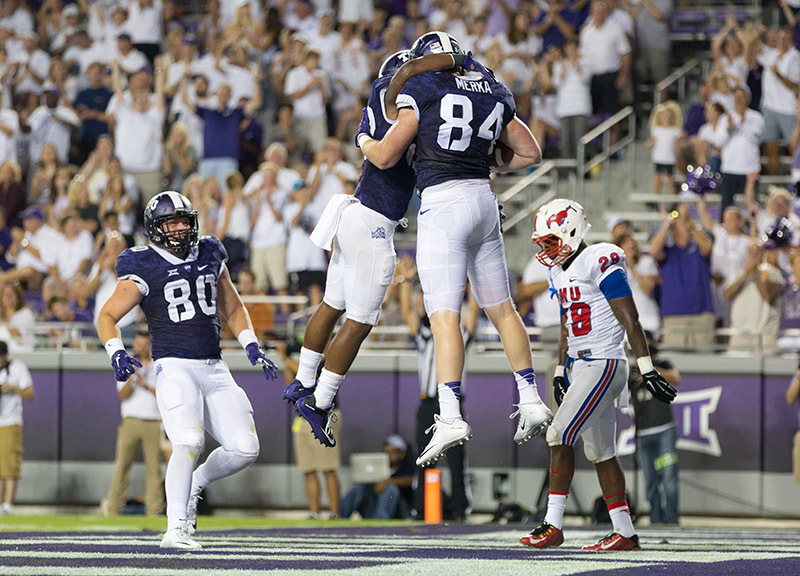 TCU tight end Dominic Merka (84) celebrates his fourth quarter touchdown with teammates. 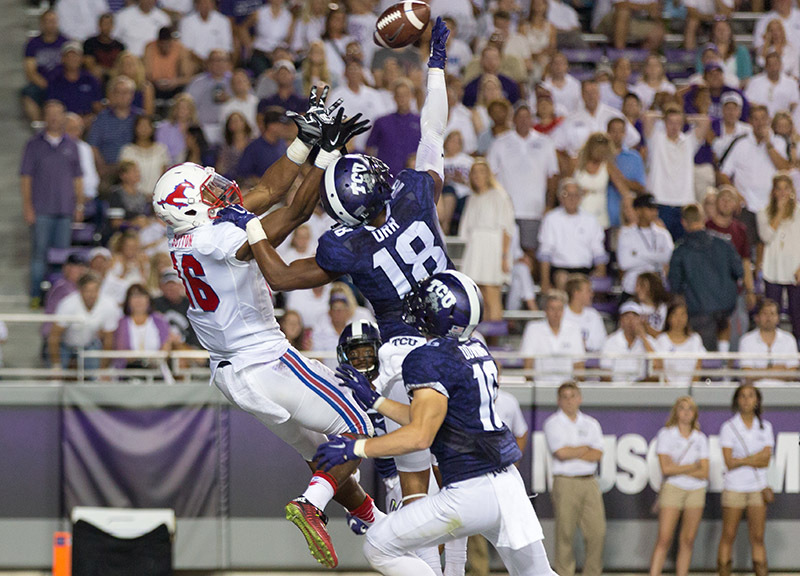 SMU wide receiver Courtland Sutton (16) can’t grab a pass out of the air against the TCU defense. Sutton finished the game with four receptions for 115 yards and a touchdown. 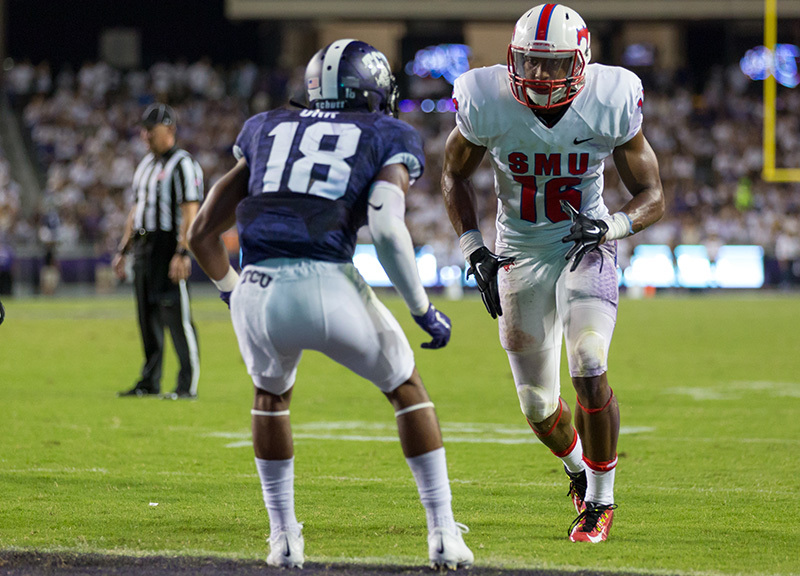 SMU wide receiver Courtland Sutton (16) enters a route against a TCU defensive back. Sutton, has become Davis’ favorite target this season. 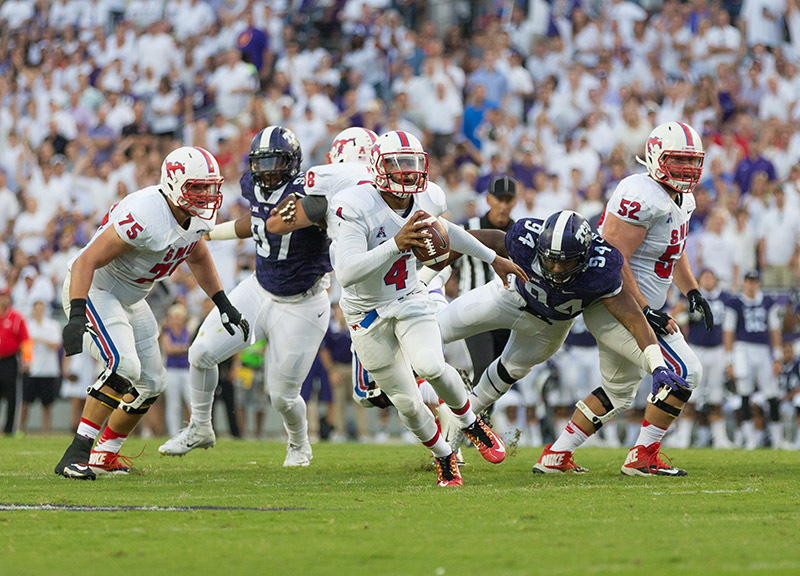 SMU quarterback Matt Davis (4) stretches the ball over the goal line against the TCU defense in the fourth quarter. 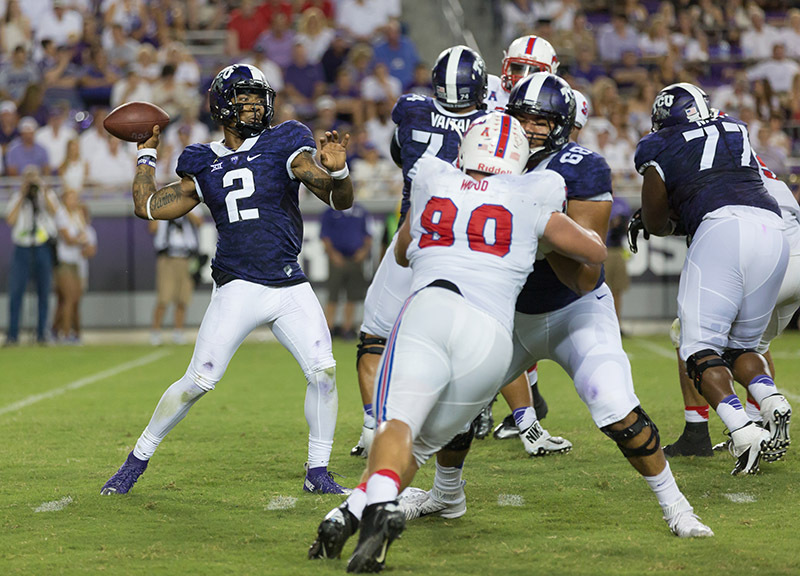 TCU quarterback Trevone Boykin (2) attempts a pass in the fourth quarter. 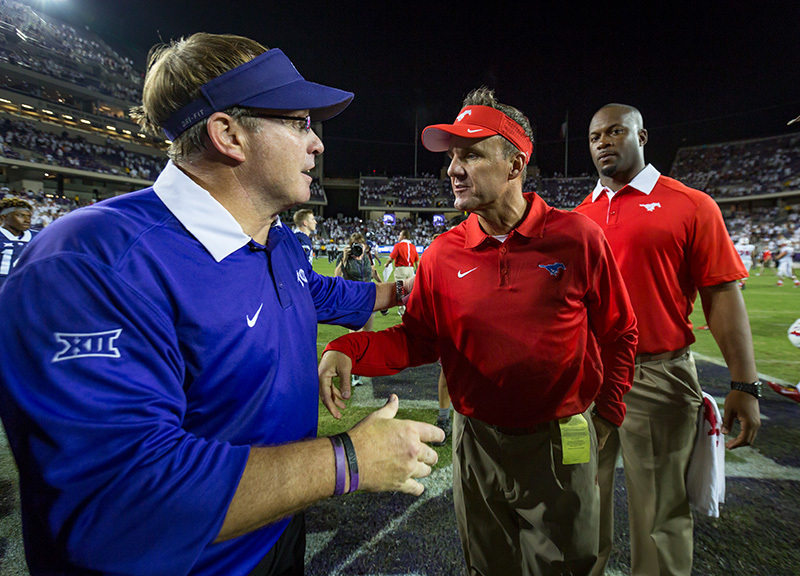 TCU head coach Gary Patterson and SMU head coach Chad Morris meet after the game. 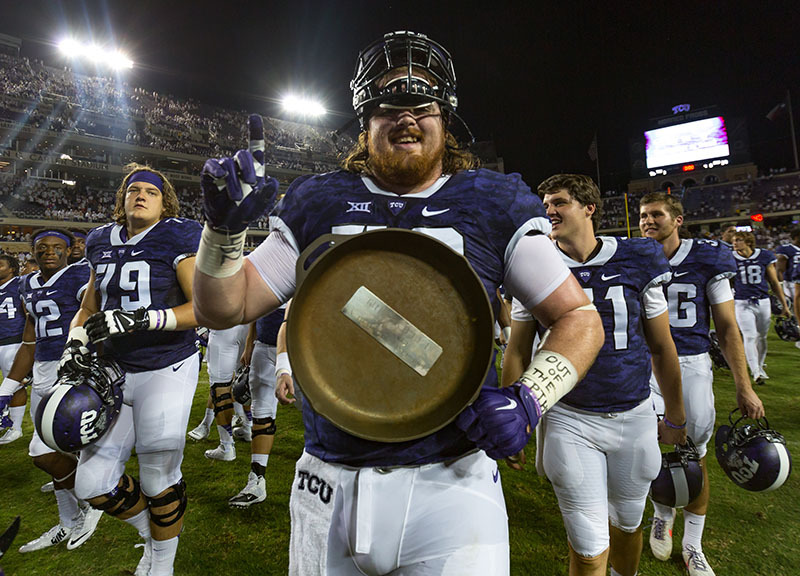 TCU offensive lineman Bobby Thompson celebrates with the Iron Skillet after the TCU Horned Frogs defeated the SMU Mustangs 56-37. 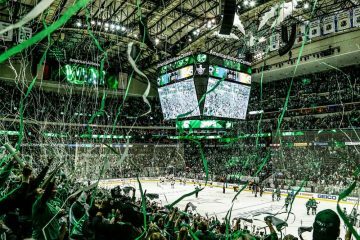 This was the 95th meeting between the two Dallas-Fort Worth area rivals. 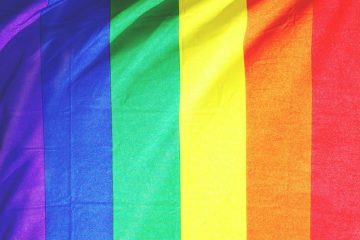 Next ArticleThings To Do On Tuesday, September 22.